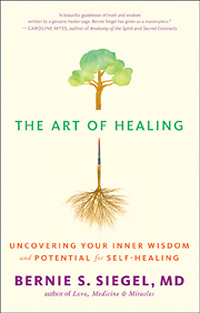 In The Art of Healing, renowned medical doctor and spiritual teacher Bernie Siegel demonstrates how science and spirituality interact — and how you can tap your body’s potential to heal. After studying the use of crayon drawings by patients facing life-threatening disease, Bernie founded Exceptional Cancer Patients to facilitate self-induced healings, which were often called miraculous. Bernie realized our bodies actually want to heal, and we can aid this innate propensity through what are currently seen as unconventional practices, including drawing, visualization, dreams, love, and laughter. Scientific studies are just now starting to officially suggest that a mind-body connection does exist in cancer patients. We hope you’ll enjoy this excerpt from a book by an expert who was well ahead of his time. Yesterday I went to get my driver’s license renewed. I anticipated lines and the usual long wait with everybody wishing they could get out of there, so I wasn’t looking forward to it. But soon after I arrived, a woman at the counter called my number. I looked around, surprised. Many of these people had waited much longer than I had; it had to be somebody else’s turn. But she called out my number a second time, so I went up. As soon as I got to the counter, a smile of recognition spread across her face. It turned out that I had operated on her mother many years ago. We had such a wonderful time talking and she shared how well her mother was doing. When I left she was still thanking me for helping her mother to heal. She wasn’t referring to the surgery or the chemotherapy. She was talking about her mother’s life. Imagine that. It wasn’t about her physical body or the disease; it was about the things that made her mother’s life meaningful. When I left there, I felt so good. Our meeting had not been an accident or by chance. It was a gift. There are no coincidences. What I am about to share — what led me to a new understanding of the nature of life — stems not from my beliefs but from my personal experience and my work with patients and their families. My attitude of keeping an open mind allowed me to gain much more from my experiences and become a better healer than those in the profession who say they can’t accept what they can’t understand or explain. If we don’t seek knowledge, we don’t learn; we lose the opportunity to live our lives in a creative way. So I never stopped asking the important questions. What do I mean by the important questions? The questions we must ask are: How does the invisible become visible? What part of our being still sees when we leave our physical body in a near-death experience? How do we intuitively know what plans our unconscious mind is creating? How do clairvoyants and psychics communicate with people and animals, whether distant or dead? How does the community of cells in the body speak to the conscious mind about its needs and health? And what is the language of creation and the soul? The invisible I talk about is what lies within our physical, mental, emotional, and psychic body. Most of us become aware of our inner harmony or disharmony through moods, feelings, and symptoms, and we rely on medical examinations and lab tests to know what is happening inside the body. But imagine if we were able to know before a physical affliction or emotional breakdown awakened us. How much healthier we would be and how much fuller our lives would become. Because of physicians’ limited medical training, rarely do we have the option to learn about the true cause of disease. And yet it is possible to prevent disease and emotional breakdown. If we take the lid off our unconscious, we can be guided by a deeper knowing. The practices and techniques of going within allow us to communicate with and learn from the greater intelligence, whether we choose to do so through spontaneous drawings, dreams, meditation, breath work, or any number of practices that place us within the healing realm of our inner wisdom. Communication with the greater intelligence is not only possible, but it also happens all the time whether we are aware of it, and tuned into it, or not. The same intelligence that allows cells to communicate inside the human body is inherent in all life-forms. It is characterized by its fluidity and moves with both intention and abandon, crossing all barriers of matter, time, and space. It serves us in ways that often seem like coincidence. Unexplained happenings, healings, and lifesaving or comforting messages appear just at the moment you need them, as happened to me yesterday, when my wait to renew my driver’s license was cut short and ended with the gift of gratitude. To be receptive to this communication, whether it comes to you through symbols or words, you must quiet your mind, like a still pond, with no turbulence to obscure its reflections. Today was a good example. I’m the caregiver for my wife, Bobbie, who has been living with multiple sclerosis for several decades. There are days when I have my hands so full of caregiving and other responsibilities that everything seems overwhelming. It’s a challenge sometimes to love my fate and learn the lesson of compassion. While devoting most of my life to healing people, I have encouraged them to care for themselves as well as they do for others. But living the sermon can be hard to do when you’re providing long-term care for someone you love. It’s easy to forget that you too have needs. This morning, I took the dogs for a walk in one of my favorite places. The cemetery near our house is several centuries old. It’s out in the suburbs, and rarely do I meet anybody there, unless it’s the anniversary of somebody’s death or a funeral is taking place. Because the cemetery is so peaceful, I can let the dogs run around. For me, it’s like a walking meditation, and for them it’s an adventure. Dogs are masters of living in the moment. Today the dogs discovered something on the ground, not close to a grave but lying beside the road. I went over and picked it up. It was a tiny white teddy bear with the message Love Me on its chest. The bear was as clean and unmarked as if it had just come off the store shelf. I looked around the cemetery; there wasn’t a person in sight. I read the words again out loud: Love Me. I felt as if somebody had put it there knowing that this was the message I needed. It was such a gift. I put the bear in my pocket and took it home. Apparent coincidences like this one happen exactly when they are most needed. When you allow yourself quiet moments, you increase the opportunity to receive messages of love and support. The little bear now sits on the kitchen counter with other teddy bears I have found. I create shrines with them in our home to give me therapy all day long. The language of creation and the soul is expressed in many ways, sometimes in a subtle whisper, other times spoken so clearly, it is difficult to doubt, let alone ignore. I used to be a skeptic because I didn’t know any better. I wasn’t trained to look through any other lens. But over time, I learned to open my mind to other kinds of communication and possibilities. I have had an animal intuitive locate our lost cat in Connecticut while she sat in California. I have had a near-death experience and, through this, learned that we are more than our bodies. I have had past-life experiences and had messages from dead patients delivered to me through mediums. I have even heard the voices of the dead speak to me. I did not seek any of these experiences, but I have lived them. Rather than deny the reality of these occurrences on the basis that I could not understand them, I sought, like astronomers and physicists, to accept what I experienced, explore the invisible, and communicate with it. The psychotherapist Ernest Rossi has observed that “our daily and hourly life experiences, sensations, thoughts, images, emotions and behavior can modulate gene expression and neurogenesis in ways that actually can change the physical structure and functioning of our brain.” What he meant is that your mind is like a remote control with an infinite number of channels to choose from (the greater consciousness), and your body is like the TV screen that plays whichever channels you tune in to. If you limit yourself to the channels accepted by your peers, your life will be all about staying within the boundaries of their discipline, and your measure of success will be based on the amount of recognition you have achieved. In other words, if you pay attention to the money channel rather than the spiritual channel, your life becomes all about material things, and your measure of success is based on what you have accumulated. If you pay attention to the spiritual channel, your life then focuses on improving the world, and your measure of success is based on what you have done to enhance life. You are no longer governed by social, political, and religious rules and regulations. Your life, which was God’s gift to you, becomes your gift to God through your actions. If you have trouble believing that genes can act to communicate important messages that initiate immediate survival responses, think about how bacteria learn to resist antibiotics, viruses resist antivirals, the wounds of living things heal, living things resist parasites, and more. All of these processes require a form of intelligence that grasps the situation and then communicates a desired response to the rest of the body’s cells. And this needs to be done at the level of genes if the knowledge is to be passed to future generations. Knowledge and memories are stored not only in our brains but also in the cells of our bodies. This becomes most apparent when a recipient of an organ transplant awakens from surgery with new, unique memories and some preferences of the person whose organ is now within her body. Soon after Claire Sylvia had her heart-lung transplant operation at Yale–New Haven Hospital, she was asked what she wanted more than anything else, and she said, “Actually, I’m dying for a beer right now.” She asked herself, why did I say that? She never drank beer; she didn’t even like beer. It so happened that the donated heart had come from a beer-loving teenager who rode motorcycles. Later he came to her in a dream and told her his name. Eventually she found the family through their son’s obituary, got to know them, and learned more about their son. Claire, whom I discuss further in chapter 4, asked me to come and see her because, although everybody thought she was crazy, she knew I would listen to her. She wrote a book about her experience, A Change of Heart. Evidence of invisible communication between particles smaller than atoms has been around for a long time. For example, biological mutations that happen within one variety of plant in one part of the world have also been recorded happening in the same variety of plant in other parts of the world. Knowledge is communicated, too, such as when a species of animal learns to use a stick as a tool for a specific task and the skill is learned at the same time in other parts of the world, within the species, even though no visible means of communication or physical connection has taken place. In England, after many years of milk delivery, birds suddenly learned to peck open milk containers that had been delivered to people’s homes. During World War II, milk deliveries were cancelled. When the war ended and milk was again left on people’s doorsteps, the birds immediately began to peck open the containers. Due to the length of time involved, few of the latter group of birds had been alive when the milk deliveries ceased. How could the untrained youngsters so quickly understand what to do? Once physicists identified nonlocality (the subatomic property of quantum particles influencing other particles without using physical exchange of force or energy), observers recognized that it explained certain phenomena, such as animals knowing skills they were never taught. What traveled across the world and across generations was not matter but intelligence. In Western medicine, when doctors hear about something that wasn’t a part of their education or training, they often say, “I can’t accept that.” What they mean is: “I can’t explain it.” So they reject it. But if we want to utilize our potential, we need to keep an open mind. William Bengston, PhD, in his book, The Energy Cure: Unraveling the Mystery of Hands-On Healing, wrote about his experimental research on mice that had been injected with an aggressive cancer with a 100 percent track record of becoming terminal in a matter of weeks. Bengston trained student researchers to perform a hands-on healing technique called image cycling. The researchers had never practiced healing, nor did they have any interest or faith in it. In the majority of cases, the mice were completely healed of the disease. This result happened not once but many times over during the controlled experiments in the science laboratories of several highly respected institutions. Even Bengston’s peers who had observed the experiments, seen the controls, and witnessed the amazing results refused to believe that traditional medicine would ever take his work seriously. Near-death experiences tell us we are more than just physical bodies. Jung often said that psyche and matter are complementary aspects of the same thing. I believe these two aspects communicate with each other through images, the language of creation and intention. We can, through the images in our dreams and spontaneous drawings, tap our inner wisdom and reveal the authentic person we are truly meant to be. We can remove negative messages that have been implanted in our minds and retrain our thoughts using creative visualization and positive affirmations to adopt life-promoting attitudes. We can learn how to live in the moment and utilize the healing power of daily practices such as laughter, meditation, and journaling. Loving and healing our lives is not only about dismantling disease: it is also about being healthy, at peace, and fulfilled. In The Art of Healing, I discuss all of these topics as well as the benefits that can be gained from working with, and learning from, animals, psychics, and intuitives. While sharing actual patients’ stories, I hope to illustrate on a practical level how others have incorporated creative practices with positive results. Throughout the book, I also offer a variety of prescriptive exercises (each labeled “Doctor’s Rx”) to help you explore your own inner world of wisdom. Since giving up surgery to help my patients heal in a different way, I have referred to myself as a “Jungian surgeon.” I now use tools other than surgical instruments to help patients. A box of crayons, a water gun, a noisemaker, and a Magic Marker became four of those tools. You will read about the formation of the Exceptional Cancer Patients therapy group that my wife, Bobbie, and I started. The group still meets regularly and has helped hundreds of patients heal their lives as well as their bodies. People have the potential built into them to induce self-healing. Time and again I have seen my patients experience many positive results when they adopted some of the techniques and attitudes covered in this book. On my website, berniesiegelmd.com, I offer books and meditation CDs, as well as individual guidance in the section “Ask Bernie a Question.” In the many articles and interviews posted on the site, I recommend creative tools that guide people in the decision-making process they use in their day-to-day lives and when confronting a variety of challenges. This book, The Art of Healing, is meant to augment these tools, helping people learn how to live (or die) in harmony, wholeness, and peace. I want to share my method of Jungian surgery with the world, particularly with health care professionals and with patients and their families so they will come to understand how somatic aspects of health and disease are inseparable from the natural integration of mind, body, and spirit. We spend a lot of time and money exploring outer space, but inner space offers the same wonder and mystery, and it should be included in our medical professionals’ education. When we open our minds, when we listen to and draw from our inner wisdom and the greater consciousness, we begin the fulfilling and sometimes miraculous journey toward health and self-induced healing. When we agree to take this journey, we become the artists, and our lives, the canvas. I invite you now to adopt the curiosity and openness of a child. Take my hand and walk with me through these pages. You will soon discover as we work together that you have been creating, practicing, and experiencing the art of healing. When the artist is alive within us, we become stimulating, creative beings from whom everyone around us can benefit. So read on, pick up your brush and palette, and start living your authentic life. Bernie S. Siegel, MD, retired from surgical practice in 1989 and has since dedicated himself to humanizing the medical establishment and empowering patients. He is a sought-after speaker around the world on patient and caregiver issues.